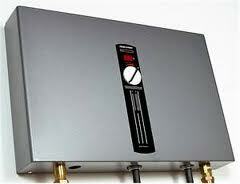 Tankless water heater installation and repair is something that must be left to trained, professional plumbers. A homeowner may have found that their water heater no longer functions as they’d like, but there are solutions that can change the way a family gets hot water. These solutions can even lower the water and heating bills in the house every month. All with the help of an expert plumber, a change in the family’s lifestyle could bring about massive savings. If you are in need of any plumbing services in Atlanta call us now at (404) 753-9191 and schedule an appointment, or click here to have our staff reach out to you! A tankless water heater is a heating system that takes water through a small unit that instantly heats the water and sends it up to the faucet or shower that is set to hot. These units can be affixed to the wall and will allow for the space where the old water heater was located to be utilized for some other purpose. These units use less water, do not build up pressure, and they allow for the family to remain safer. Installation and repair of these units is a very delicate process that must be overseen by a professional plumber who understands how to detach the water and gas lines. When the old water heater is removed, a licensed plumber is the only person who is able to remove the gas lines safely and reattach them to the new unit. Also, repair of these units can be handled much more quickly and easily due to their small size and relatively simple construction. When putting a tankless water heater in the home, every plumber can make sure that there is less energy used and no water is stored in a massive tank. This means that a simple maintenance appointment every year can keep this type of unit working properly. Preventing emergencies with a water heater start with the homeowner understanding what is going on in their home. Often, the homeowner is quite aware of how their water is heated, and the changes in the efficiency of the heater are something that could indicate problems. With the help of a professional and licensed plumber, every suspicious homeowner can have their water heater checked out. While the homeowner cannot diagnose problems on their own, it is wise for them to ensure that there is not a problem. Plus, a tankless water heater is much easier for a homeowner to check. There is no danger in being near the tankless heater, and emergencies can be avoided simply by getting a large water heater out of the home and using something that does not store water under pressure. Every homeowner can save money on their monthly water and heating bills when they install a tankless water heater. Plus, improving the safety of their home and preventing water leaks and emergencies is something every homeowner should take seriously. For these services and many more, contact Plumbing 4 Less now at (404) 753-9191.